The stone is located dear tot he church building, next to the doorway into the church hall. The memorial stone above was erected in 1993 by the SCMA and others to replace the older stone of 1823, which lies in pieces in front of it. 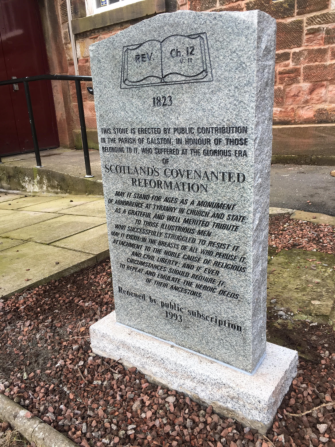 This stone commemorates five Covenanters from Galston parish. John Richmond, younger of Knowe, was executed at Glasgow Cross on 19 March 1684 and was subsequently buried in the Cathedral burial ground. James Smith, of East Threepwood, was shot at the side of Burn Anne by Captain Inglis. The stone states that he was buried by the side of the stream where he was martyred. Many will know of the confusion with this information and the stone in Mauchline kirkyard which commemorates James Smith, buried there, after dying of wounds in Mauchline prison. Whether or not there were two James Smiths has never been satisfactorily proven. Next to be listed are James Young and George Campbell, both of whom were banished in 1679. They were among the hundreds of Covenanters who were on board the ’Crown of London’ which was wrecked at Mull Head of Deerness on Orkney. Last on the list is Rev Alexander Blair, the parish minister. A graduate of St Andrews in 1638, he became minister at Galston in 1643. He was involved in the Battle of Mauchline Muir in 1648. He was removed from his charge in 1662 at the outing of the ministers. He was held in prison for nearly four months and once he was released he was forbidden to live within his own parish, or else within the bounds of the cities of Glasgow or Edinburgh. Undaunted, he continued to preach, and in 1669 he was summoned to Ayr by Major Cockburn, charged with preaching and baptising. He was eventually sent to prison in Edinburgh tolbooth, where he lay from 8 July to December 1673. He had been accused of not praying for the king on Restoration Day, 29 May. It was declared that, ‘Mr Blair, having publicly disowned the king and council’s power and authority to give him instructions, the lords ordain him immediately to be carried to the Tolbooth of Edinburgh, there to remain till further orders.’ For the next six months he suffered terribly in Edinburgh’s prison. He became so ill that on 4 December 1673 he was ‘allowed by the lords to go to a house in Edinburgh, by reason of his sickness, upon caution given for him’. A bond of £274 Sterling was pledged to ensure that he would return one month later. Once the four weeks had passed, his health had still not improved, and so his time out was extended by a fortnight. However, he died before this period came to an end. In his will he left money ‘for such pious and charitable uses as [Sir Hew Campbell of Cessnock] see fit’.